Air New Zealand has reported underlying earnings of NZD256 million (USD200 million) for the financial year to 30-Jun-2013 and in so doing delivering on its promise to more than double profits on the prior year. The net profit after tax was NZD182 million (USD142 million), up 156% on the previous year. The result, which is at the upper end of the guidance range provided in Jun-2013, follows up on the 300% improvement reported in the first half of FY2013 with all parts of the network contributing profitably. CEO Christopher Luxon said Air New Zealand needs to put together a string of profits over the coming years which will allow the carrier to reinvest in the business as part a “virtuous circle of continuous growth”. Air New Zealand has focused on growing revenue through improving its sales and marketing, while also reducing costs, Mr Luxon said. In order to attract travellers in long-haul markets Air New Zealand needs to become a “sales and marketing machine”. Forward bookings for the next six months were looking strong across all parts of the business, Mr Luxon said without going into specific details. Operating revenue was up 3% to NZD4.6 billion (USD3.6 billion) on capacity growth of 1.7% across the group. Group yield improved by 0.9% to NZD13.5c (USD10.55c) per RPK, driven by a 4.3% gain in long-haul yields. Short-haul yields fell 2.3% as a result of competition. Unit costs reduced 3% to give a CASK of NZD11.22c (USD8.77c). Gearing for the group also improved to a record low of 39.1%, down 7ppts. A fully imputed final dividend of NZD5c (USD3.9c) per share will be paid, taking the total dividend for the year to NZD8c per share (USD6.3c), up 45% on the previous year. With the long-haul network returned to profit with continued improvements in demand and yields, the network is now positioned for growth. Air New Zealand expects to announce new long-haul destinations over the next year as it focuses on first deepening its Pacific Rim network before exploring potential new destinations. In addition, the carrier is also pursuing alliance partnerships similar to its successful codeshare alliance with Cathay Pacific as it seeks to grow long-haul traffic. Air New Zealand and Cathay Pacific formed an alliance in Dec-2012 under which the two carriers codeshare on each other's services between Auckland and Hong Kong. The alliance coincided with Air New Zealand’s decision to pull off the loss making Hong Kong-London route. Mr Luxon said most of the benefits of the Cathay alliance will start to flow in FY2014, but both carriers were already experiencing improved performance on the Auckland-Hong Kong route than was the case before the alliance. It is anticipated that the alliance will eventually provide Air New Zealand with greater access to the Chinese market where the carrier has been struggling to develop demand. Air New Zealand and Cathay have unspecified commercial arrangements for onward connections to mainland China from Hong Kong. Air New Zealand currently operates daily between Auckland and Shanghai with a mix of 777-200ER and 767-300 aircraft. But Air New Zealand is also under pressure from China Southern which operates daily to Auckland from Guangzhou with A330-200. The rapidly growing Chinese travel market is expected to become New Zealand’s second largest visitor source market by the end of the decade, behind Australia. Chinese visitors to New Zealand grew 27% in the year to Jul-2013 to nearly 225,800. The carrier is benefiting from a shift in global power from the Atlantic to the Pacific and a corresponding increase in demand for Asian and Pacific routes, with demand from China up 55%. Air New Zealand has focused most of its long-haul capacity increases on the recovering United States where it has added about 500 one-way seats per week during FY2013 taking the total to 7,885 seats. That will increase to 9,409 one-way seats per week in Dec-2013 when Air New Zealand increases weekly frequencies on the Auckland to Los Angeles route from 14 to between 16 and 18 times weekly from 13-Dec-2013 until 07-Mar-2014. Air New Zealand is confident that its trans-Tasman alliance partner Virgin Australia, in which it holds a 23% stake, has the right strategy in place for growth, notwithstanding Virgin Australia’s surprise warning that it will report a loss of between AUD95 million (USD85 million) and AUD110 million (USD99 million) for FY2013 on 30-Aug-2013. Virgin Australia has during 2013 switched over to the Sabre booking system and expanded its domestic network reach through the acquisition of a 60% stake in Tigerair Australia and acquiring Western Australian regional carrier Skywest to better compete with Qantas. “Those are strategies I think we are all very supportive of and very confident will pay off in the long run,” Mr Luxon said. Mr Luxon said the investment in Virgin Australia provides exposure to the larger and growing Australian domestic market and cements the trans-Tasman alliance between the two carriers. Air New Zealand expects a decision early in Sep-2013 from the Australian Competition and Consumer Commission and the Foreign Investment Review Board on its application to increase its stake in Virgin Australia from 20% to 23% and ultimately to 26% under the creep provisions of the Corporations Act, which allows a 3% increase every six months. The carrier is one of three foreign carriers with a shareholding in Virgin Australia, including Singapore Airlines with 19% and Etihad with about 10%. Virgin Australia founder Sir Richard Branson’s Virgin Group also holds 13.3%. A decision is also expected soon from the ACCC regarding an application by Air New Zealand and Virgin Australia to renew their trans-Tasman alliance. Draft approval was granted in Jul-2013 for a further three years. But the alliance partners had applied for a five year term, matching that granted to the rival Qantas-Emirates trans-Tasman alliance in Mar-2013. The ACCC also rejected Air New Zealand and Virgin Australia’s request for all minimum capacity conditions to be lifted. The airlines argue they have demonstrated that their alliance is not harmful to consumers and has resulted in competitive responses from other airlines. Furthermore, the capacity conditions may actually harm consumers by preventing the carriers from efficiently reacting to changes in market conditions. The regulator has instead made some significant changes to the routes that will have capacity and growth conditions imposed on them. In an alternative proposal the alliance partners propose that services to Brisbane from Queenstown, Dunedin, Christchurch and Wellington be grouped. It also proposes that conditions imposed on the Dunedin to Sydney and Melbourne service be removed, as well as conditions on the Auckland to Gold Coast and Christchurch to Melbourne routes, or if conditions are imposed on those routes that they also be grouped. In either case the carriers have requested that if a growth factor is applied that this should initially be set at 0%. Submissions on a counter proposal from the alliance partners closed on 16-Aug-2013. Renewal of the alliance authorisation must be separately approved by the New Zealand Ministry of Transport. 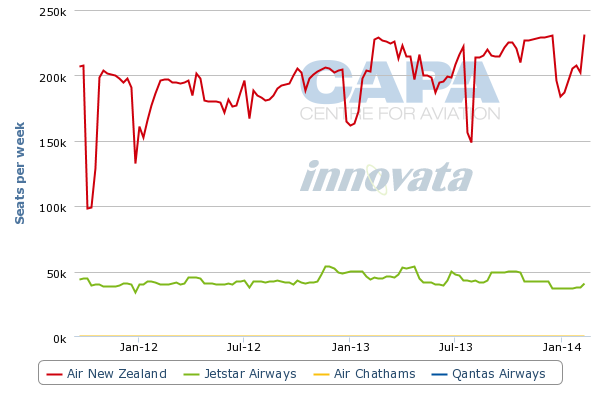 Air New Zealand’s main profit driver is its dominant position on the domestic network where capacity measured as RPK increased 4.2%, but yields fell 5.3% in the face of competition for Jetstar but also a NZD26 million (USD20 million) increase in airport charges. The replacement of the 737-300 fleet with A320s will add significant capacity to the domestic network and will place Air New Zealand in a stronger position to compete with Jetstar which maintains about a 28% market share on routes between the main centres of Auckland, Wellington, Christchurch, Dunedin and Queenstown and about 16% of overall domestic capacity in Aug-2013. Air New Zealand will further strengthen its monopoly hold on the domestic regional network with the addition of seven ATR72-600s, three of which have already been delivered and the remainder due to arrive by 2016. The arrival of the A320s and ATRs has allowed Air New Zealand to increase domestic capacity to 198,000 return seats per week in Jun-2013, up nearly 10,800 on the same time a year earlier. Capacity will increase by a further 32,400 seats by Dec-2013, according to CAPA and Innovata data. Air New Zealand will invest NZD1.8 billion (USD1.4 billion) in aircraft over the next three years with the delivery of 21 aircraft, including two 777-300ERs, six 787-9s, nine A320s and four ATR72-600s. The carrier’s jet fleet replacement programme hits top gear in 2014 with the arrival of eight aircraft including three 787-9s, as it accelerates the transition from a jet fleet of six types to just three by 2016. The legacy fleets of 737-300s, 767-300ERs and 747-400s will be phased out over the next three years leaving the airline with a jet fleet consisting of A320s, 777s and 787-9s, significantly improving operating efficiencies. The A320s will reduce operating costs on the domestic jet network, currently largely serviced with Boeing 737-300, while the fleet of 10 787-9 will support the airline’s Pacific Rim network growth strategy. The primary long-haul destinations for 787-9 will be Shanghai and Tokyo as well as mid-haul destinations Honolulu, Perth and Papeete, largely replacing the 767-300s. The airline expects to receive its first 787-9 in Jun-2014, for which it is the launch customer, and another two around Sep-2014. The aircraft will initially be deployed on Auckland-Perth route and occasionally on other trans-Tasman routes, followed by Shanghai and Tokyo by the end of 2014. The remaining two 747-400s will be replaced by two leased 777-300ERs which will join the fleet in Jul and Oct-2014. Air New Zealand has also issued a request for information (RFI) for the A350 and the yet to be launched Boeing 777-X as a long term replacement for the 777-200ER fleet. Air New Zealand plans to shed 180 widebody maintenance engineering jobs by the middle of 2014. Work at the Auckland heavy maintenance base is reducing as the airline and its external customers in the region acquire new aircraft which require less maintenance. The airline has offered to reverse a decision to outsource the NZD100 million (USD78 million) refurbishment of its fleet of eight 777-200ERs which would provide a 12 month reprieve if unions agree to revised terms. The fleet refurbishment was originally to be done in Auckland “with pride”, but Air New Zealand could save NZD12 million (USD9.4 million) by outsourcing the work. Earlier in the year the carrier announced the loss of 85 jobs at its Safe Air maintenance subsidiary after a contract to refurbish Royal New Zealand Air Force C-130 Hercules aircraft. Air New Zealand’s third best profit performance in the carrier’s history is testament to the airline’s efforts in establishing a platform for growth in the prior year. The carrier is now well positioned with a healthy balance sheet to strengthen and grow its Pacific Rim network. Much of Air New Zealand's success over more than a decade can be attributed to chairman John Palmer who resigns from the board at the carrier’s annual shareholders’ meeting on 27-Sep-2013. Mr Palmer was appointed following the state bailout of the airline in late 2001 and has played an integral part in rebuilding the flag carrier. He will be replaced by current deputy chairman Tony Carter.